It can be hard to find a post office job in Birmingham, Alabama – but it’s not impossible. Working for the USPS may involve working at one of the local Birmingham post office locations or a regional mail processing facility. 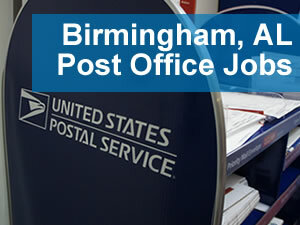 The US Postal Service has frequent job openings in Birmingham, Alabama at many of its local facilities. Most people who want to work for the post office because of competitive salary, comprehensive benefits, or job security. To land a Postal job, you will need to meet some standard eligibility requirements and pass a post office exam. To learn more about Birmingham, check out the Birmingham Chamber of Commerce, or watch the video below. Working for the US Postal Service is a dream for many people looking for a new job/career. Working for the Post Office can provide a secure job with a comprehensive salary and benefits package. There are a few requirements that apply to jobs with the US Postal Service – but they are pretty easy to meet. In general, you must be over 18 and a US Citizen or permanent resident. Additionally, you should be able to pass a drug screening, background check and medical evaluation. Some positions with the post office will require a valid driver’s license, safe driving record, and a complete and recent employment history. You can learn more by checking out our detailed Postal Service Job requirements. Most USPS employees enjoy a comprehensive pay and benefits package. The base salary varies by position, but does include regular salary increases, overtime pay, and increased pay rates for night shift or for working on Sundays. Full information on the USPS Salary and Benefits will provide more details. The lion’s share of jobs with the postal service deal with mail/package processing and delivery. Besides delivery and processing jobs there are roles in finance, HR, Corporate IT, and marketing. In addition, the post office has special programs for military personnel, recent graduates and current students. Details on the various jobs available at the post office can help you decide which is the right role for you. Virtually all entry-level jobs at the Post Office require you to pass a postal exam. The most widely held positions (mail processing clerks, mail handlers, and city carriers) are required to pass the 473 Postal Battery Exam. If you are serious about passing, make sure to check out our guide to passing your postal exam.